Cinnabon joins the cold brew coffee crowd with the launch of new Cinnabon Cold Brew Iced Coffees. The new line comes in three flavors: Signature Cinnamon Roll, Vanilla, and Salted Caramel. Cinnabon's cold brew coffee can be found in 16-oz and 24-oz sizes with a suggested price of $2.99 and $3.39, respectively. 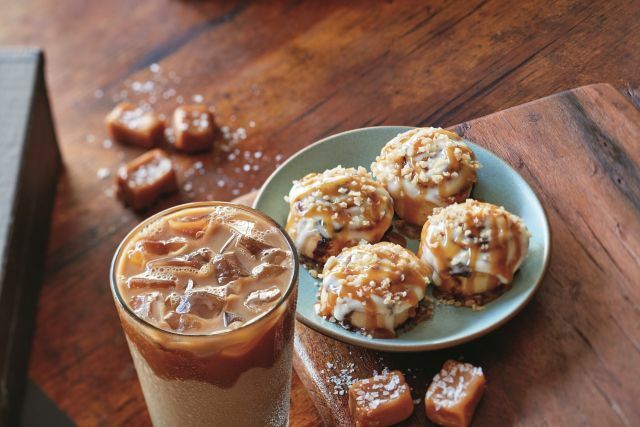 While the new drinks are permanent, to celebrate the launch, for a limited time, you can top any "bon" with a creamy caramel drizzle and salty toffee crunch for an extra 50 cents. Cold brew refers to making coffee by steeping grounds for a longer period of time (hours to days with room temperature or cold water) versus more traditional methods (which typically to take seconds to minutes and extracts coffee with hot water). The resulting coffee from cold brewing tends to be less acidic and more smooth. In recent years, as the cold brew coffee has grown in popularity, chains like Starbucks, Dunkin' Donuts, and Chick-fil-A have added it to the menu. You can also easily find it at the supermarket these days.